I've had 3 nail mail deliveries this week (and 5 kilos of coffee beans) so I thought I'd share (sorry I can't share the coffee, there's less than 4 kilos left already). I took advantage of the Glitter Gal Valentines Day special offer, of a free 9mL sparkle nail polish with any order, to finally order Lizard Belly. I also grabbed White Sparkle and chose Deep Purple Sparkle as my freebie. Yep I only got the 9ml bottles. Much as I prefer bigger bottles I rarely finish one and I figure if any of these turn out to be a favourite I'll just buy a bigger bottle later (when I can afford it). Actually I tend to panic about running out once a bottle is 1/4 used and start thinking of buying a backup but so far I haven't given in to the need for backups. I also got these CND Effects. 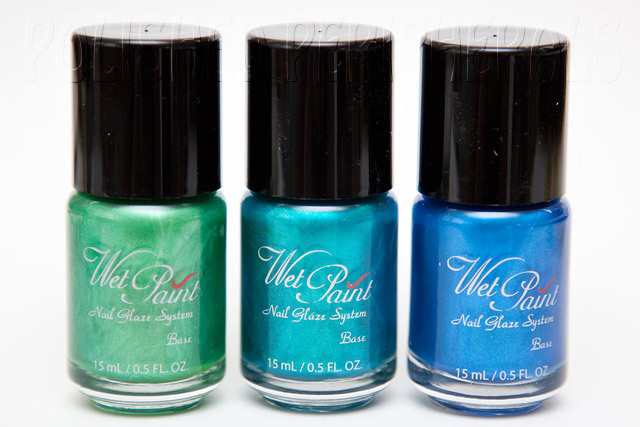 Violet Shimmer, Emerald Shimmer, Copper Shimmer and Ice Blue Shimmer. I'm a little addicted to layering so these have been on my 'must try' list for a while. They were on sale but have taken over a month to get to me. Lastly I got some amazing Nubars. I love Nubar, I just wish we could buy them here. There are so many more Nubars I'd like to see in person. Now which should I wear first? 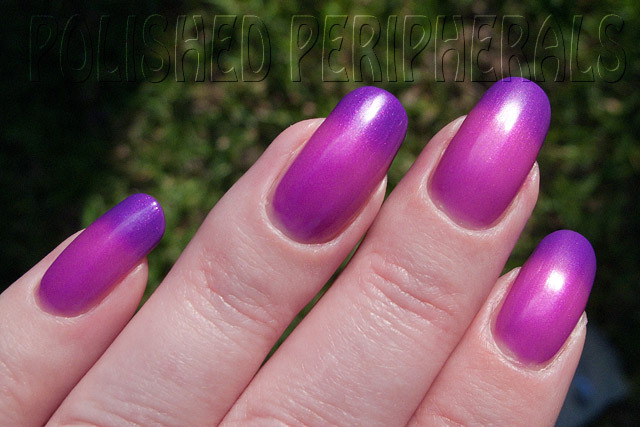 I forgot to post an update to my BYS Bright Purple colour change mani from a few weeks ago. 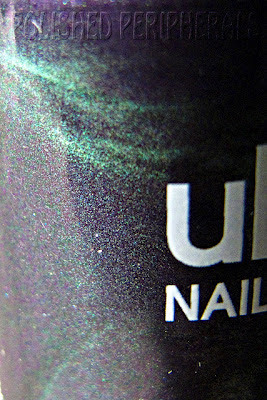 I ended up finishing it with just a simple layer of INM Out the Door Northern Lights Hologram Top Coat Silver (what a name!) which was all I needed to break up the plastic barbie pink colour that was bothering me. I still wasn't a fan of the pink but I loved the purple it changed to when my nails were cold. It was fun to see the colours change and the little sparkles from the Northern Lights were the perfect touch of bling. Most of the time my nails were pink with purple tips but I tried to take some photos to show all cold, and all warm nail colour. This involved cups of iced and hot water and some fast camera handling. Please excuse the paper towel fluff on my fingers. I was using paper towel to dry my hands after soaking in the water. This is the purple after soaking in iced water. Not quite as rich as the colour gets when fully cold but as close as I could get. It was a hot day so the colour started changing back to pink as soon as I took my fingers out of the cup. I could only fit the tip of my thumb nail in the cup. There's some weird surface chipping on my index nail (from trying to open a stuck lid) that changed at a different rate. and the pink after a a dunk in hot water. Despite the hot day the tips were already starting to turn purple by the time I had my hand dry. I haven't had a chance to wear any of them yet (I'm still wearing the mani I did for the school night) but I quickly swatched and shot them on a wheel so I could show you. First though, let me show you something I found while I was painting my nail wheel. Check this brush out! 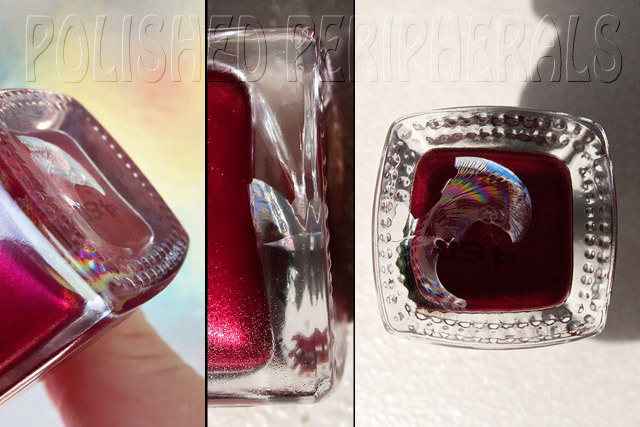 This is the funniest thing I've had come out of a polish bottle since I tested my last batch of glitters (they melted). Yep that made me laugh. Getting the brush back in the bottle was an interesting challenge. I love the fact that the Ulta3s are so affordable that I can laugh at something like this, not like my Mari Moon set that came with melted brushes (I almost cried over them). I've learned to check the lids on polish bottles before I buy them. Quite often the lids aren't done up properly and the bottles will leak on the way home or the lids are stuck from previous leaks. It's really frustrating to get home with a new precious and find I can't open the lid so now I check anything I buy but I haven't thought of checking the brushes before. Lesson learned, I will check from now on. Anyway here's the goodies. From the left, Antique Gold, Shiraz and Copper. Yep the copper is quite orange. This is Enchanted, Cocoa and Jade. Enchanted is fascinating in the bottle. Just look at this mix of plum and shimmery green! I can't see any of the green on the nail wheel but I'm hoping it will show on my nails. Actually Enchanted is the least metallic looking of this lot. Sadly it looks quite flat on the nail wheel. 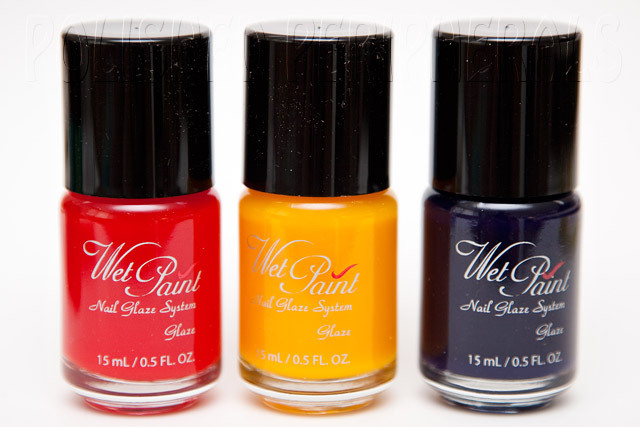 All of the colours are well pigmented, applied smooth and dried quickly. Well except for Copper, the dodgy brush made that one very tricky to test but I wasn't going to leave it out. There's a stray blob of Copper on the Shiraz swatch. Cocoa is almost a single coater but the rest definitely needed two coats so I doubt these would be any good for stamping. I found these in the Ulta3 bin at my local chemist but they are easy to tell apart from the regular Ulta3s by their black lids. I didn't grab the 7th bottle, Burnt Orange. It didn't look very metallic to me and I don't wear much orange. There was also a bottle called Pinot (I think) which had a black lid but I don't think it's part of this collection. It looked the same as Shiraz, maybe with less shimmer, so didn't get it (plus I was trying to show some restraint in front of my husband, it was bad enough I kept handing him bottles to hold and test the lids). 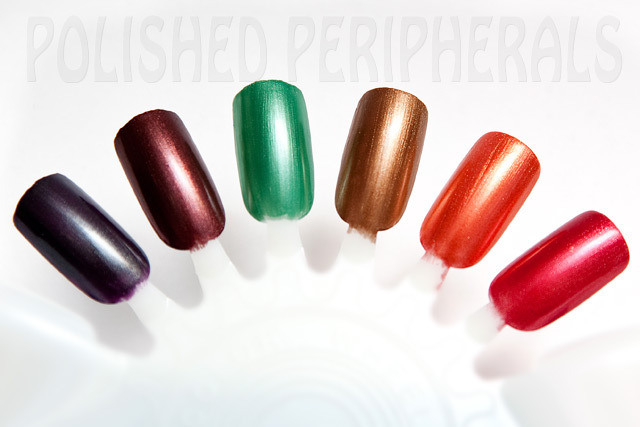 On the nail wheel, from the left, Enchanted, Cocoa, Jade, Antique Gold, Copper and Shiraz. Of the six I'm most excited about Enchanted, I just hope the green shimmer shows up when I wear it. Firstly a big thank you for all the well wishes for my little man's birthday. He was thrilled to read them. He's a bit of a computer nerd and has his own computer but he doesn't have internet access so I showed him the comments on my computer. He got a camera for Christmas and has his own blog so he can share his photos and he nags me every day to check for new comments for him. He doesn't seem to understand that to get comments he needs to keep posting and he hasn't posted any photos for a few weeks. Partially my fault because he needs my computer to post and I wont let him online unless I'm watching and lately we just haven't had any computer time together. He does get so excited about comments though :) He had a good birthday and tomorrow we're off to the museum for his birthday treat. I'm still recovering from his birthday dinner and the cleaning, cooking, hosting and cleaning again, and we're still eating leftovers. Secondly, I'm excited to say the Gumleaf Mafia have a web site thanks to the brilliant Kaz from Pretty Random. I joined the Gumleaf Mafia last month. I knew before I started blogging that I wanted to be part of this Aussie group of nail bloggers that I'd been following. I did have a list of the Gumleaf Mafia bloggers in my sidebar but now with the wonderful new web site you can just click on the cute Blingy Bill logo (up there on the right) to go straight to the site for quick and easy access to all the latest Gumleaf Mafia posts. There's a section where you can read a bit about each of the girls and I'll be sending in my bio soon. You can also find links to any giveaways and there's a list of any specials or sales we come across. 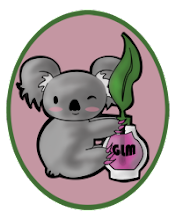 Best of all if you have an Aussie nail blog and are interested in joining the Gumleaf Mafia there's a simple form you can fill out. I really need to cut my nails. They're long enough to annoy me now but I really hate cutting my nails. Is that weird? I like the painting part, hate the cutting and filing part. So before I cut them I thought I'd try one of the heat sensitive BYS colour change polishes. I've found the colour change is most effective on long nails where the tips are cooler than the nail bed. I've used the BYS green to yellow changing polish before but hadn't tried the purple, which I bought at the same time. So this is BYS Bright Purple. It's a pink when warm and purple when cool. You can see on long nails it creates it's own french tip or gradient effect. Please excuse the dry cuticles. I would normally finish with a top coat and hand cream but this is 4 coats and I still have visible nail line so I quickly grabbed some photos while I consider whether to continue. Yep that's a lump on my little finger nail. My dad called while my nails were wet and I left a chunk of polish on the phone and did a dodgy patch up. BYS Bright Purple is a really sheer polish. I think it's a little better than the green one because that took 6 coats to look this opaque. It goes on streaky but doesn't drag, it was thin but not runny. Actually it was really easy to apply, these photos are without any clean up. It's not the shiniest of finishes, sort of semi gloss plastic, but there's an ever so subtle pink shimmer in there if you look closely. The colour change works well and it's pretty cool to watch the changes as I'm taking things from the fridge or cooking. It is pretty and it is interesting but I really don't think the barbie pink colour works for me. Actually I'm hating this on me which is why it's not finished. I don't know how to save it but don't want to remove it after all these coats. Any suggestions? Should I add a layer or glitter, flakes, spectraflair, stamping, anything? I would love to keep the colour change effect but I really need to do something to unbarbie that pink. He's very excited. Last night he helped me make 30 cupcakes to take to school today and tonight all his grandparents are coming over for a BBQ dinner. Alex is a bit of a miracle child. 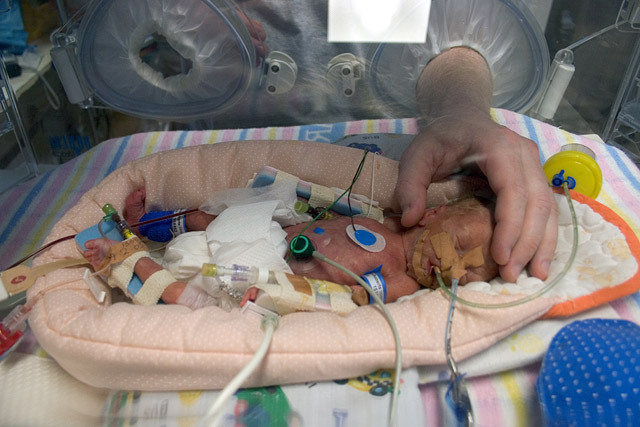 He was born at just 26 weeks gestation, weighing 670gms, and it was a long and difficult struggle to get where he is today. 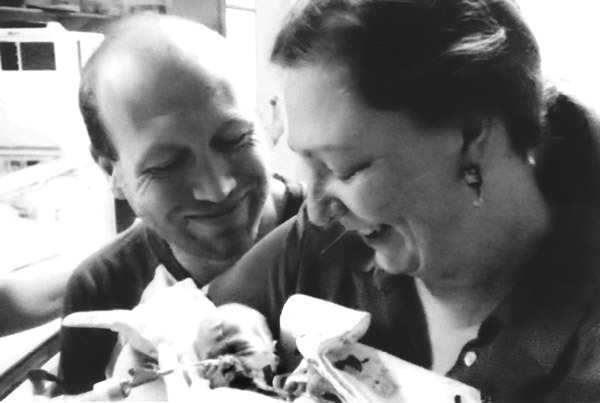 He spent his first 100 days in the hospital, 79 of those in the NICU, and when he finally came home he had to spend months attached to oxygen tanks with an average of 3 Dr and hospital visits a week. 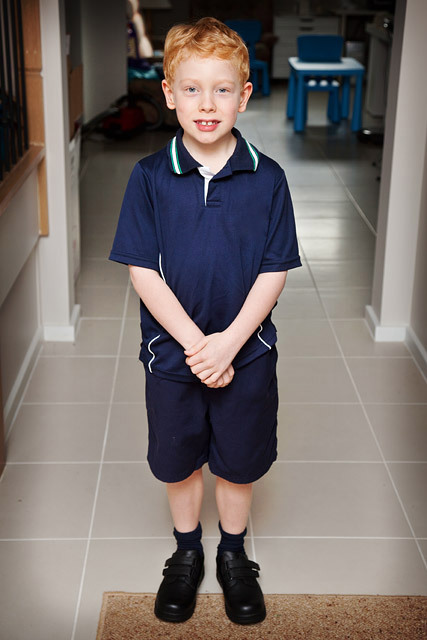 Premies face a lot of health issues, things that no child should have to go through, but we are very fortunate to be able to say that today Alex is a normal, healthy, happy child. Normal is a pretty good thing for a prem :) Today Alex is just above average in height, reads like crazy (as well as many adults), loves maths and computers and is crazy about Doctor Who. He does well at school and started second grade last week. Alex is my golden child :) Funny, quirky, clumsy, bright, loving and generous. This is one of his first photos, he was 9 days old. His earlier photos are worse than this. I'll leave these photos small so anyone who finds these sort of photos disturbing, just don't click on them. For me they are my child's precious baby photos, we didn't get to do pretty photos, but I can understand that other people don't like them (like my mom). This is our first family photo. It's not very good, one of the nurses took it for us and had problems with the camera but it's the only one we have of this moment. This was the first time I got to hold Alex, he was 4 weeks old. Prior to this I'd only been allowed to touch him through the holes in the humidicrib. His dad had to wait another month for his first cuddle. I was crying but this was the happiest moment of my life! Now on to the polish. 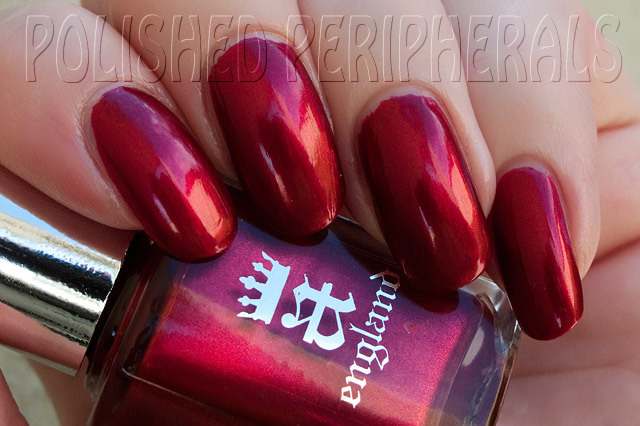 The delivery guy has been already today (for once I didn't have wet nails) and I got a parcel of polish. I thought it was from Cathy of More Nail Polish http://morenailpolish.blogspot.com.au (seriously awesome blog, if you don't know it you're missing out), part of a group buy she organised, so I very carefully cut it open without stopping to read the label. The first few bottles had me confused until I realised it wasn't from Cathy. It was an order I placed on Friday with a company in Melbourne. So that was nice and quick, well packed too. Still a little confusing because I wasn't expecting the first 2 bottles but I just went and checked the web site and it says 'for a limited time 2 extra bottles'. I didn't see that when I ordered, maybe it's new, it's certainly a good bonus :) That first bottle nearly blinded me with rainbows when I pulled it out (I had my desk lamp on because I'm making a nail polish ring). So what did I get? 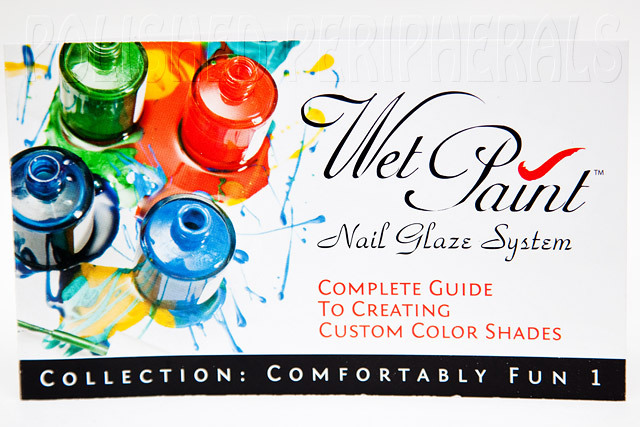 It's the Wet Paint Nail Glaze System. Something I hadn't heard of before and came across by accident but it seems like it was made for compulsive layerers (is that a word?) like me. It was too cheap and too interesting to resist. It's a 6 bottle set of 3 base colours and 3 glaze colours. The idea is you can mix and match the bases and glazes to get a whole heap of different colour results. 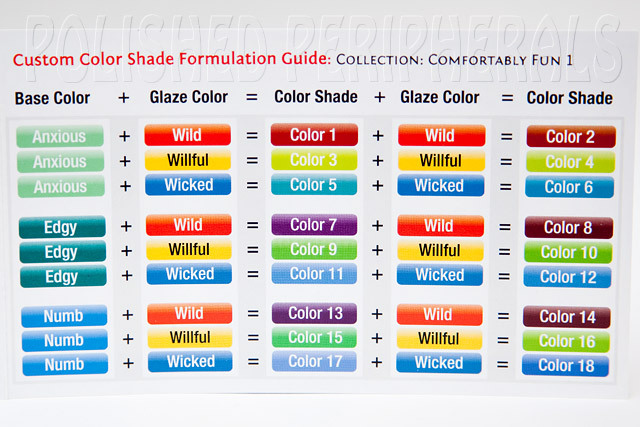 This set comes with a guide that shows how to make 18 different shades. 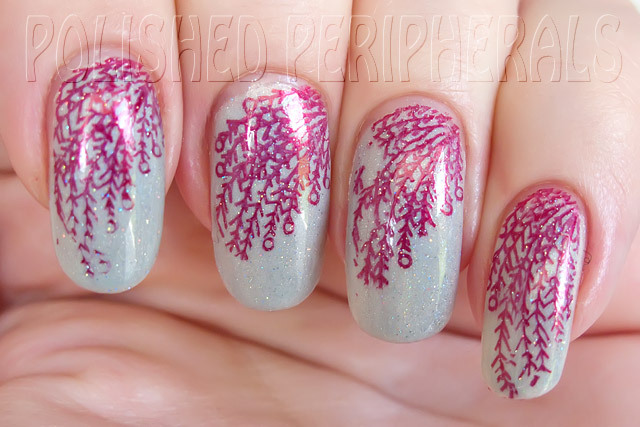 I thought it could be fun for 'jelly sandwich' type nails with layers of glitter or flakes. Here's the base colours. Left to right we have Anxious, Edgy and Numb. The glazes are (left to right) Wild, Willful and Wicked. 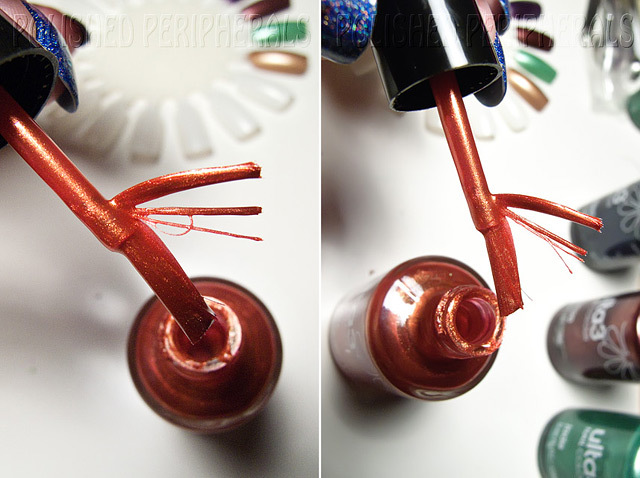 The bonus bottles are Crystal SPFX, a holo glitter top coat and Mirror Glaze, a clear coat. It will be interesting to compare Mirror to my other top coats. With a name like Wet Paint Mirror Glaze I'm expecting a very shiny finish. 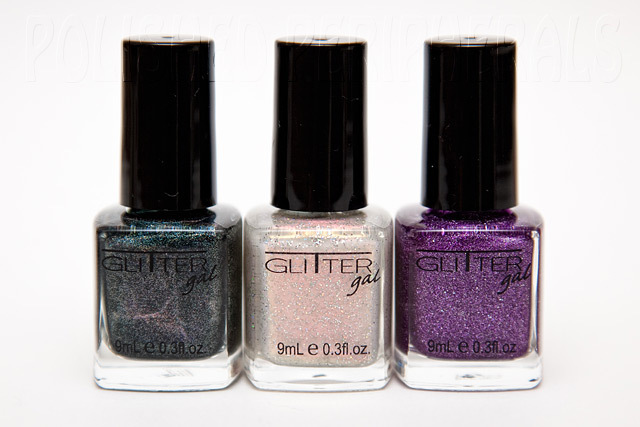 I'm looking forward to comparing Crystal with my other holo glitter top coats too. Anyone want to see a comparison post? 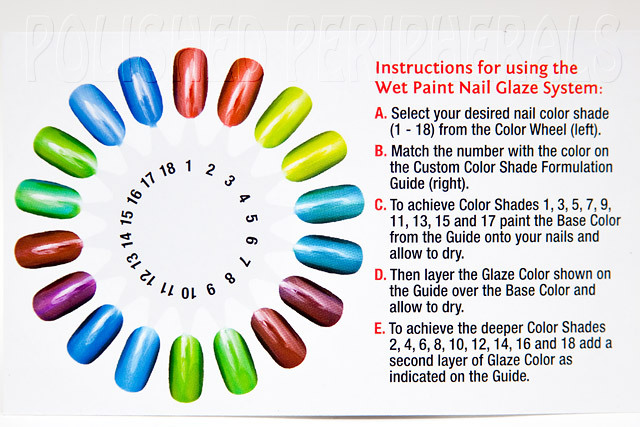 I'm really looking forward to swatching all the different combinations on a nail wheel (or 2). So far I'm impressed with the idea, the packaging, the colours, the speedy shipping and especially the price. Oh and the box says Formaldehyde, DBP and Toluene free, and not tested on animals. I can't find my glasses to read the small print on the bottles but it looks like the only one with camphor is the clear. 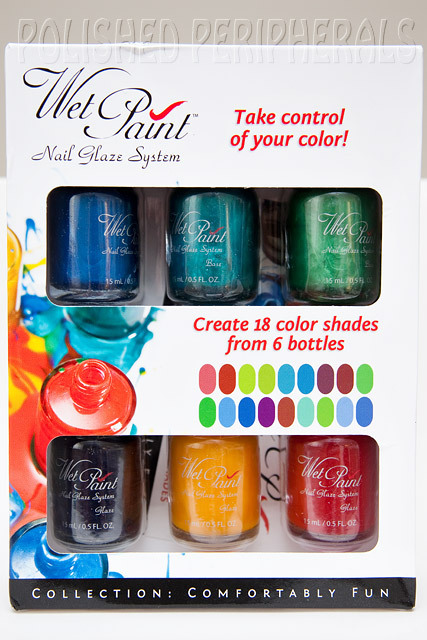 I paid $19.95AU for this set with the 2 bonus polishes (standard postage) from Kompleat https://kompleat.com.au Have a look at the site and you'll see why this was a surprise find, they're not a beauty supplier. I'm pretty sure they wont ship internationally but if you're in Australia or New Zealand check it out, stocks are limited. I reckon this would make a pretty neat gift for someone too :) I'll try to test them and get some photos up soon but for now I'm busy cleaning and preparing for tonight's birthday party. I'd like to introduce you to my new boyfriend (just don't tell my husband). 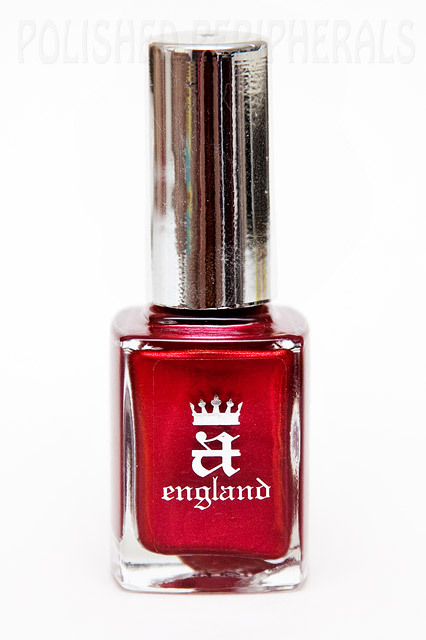 This is a-england Perceval, the new love of my life. These photos were taken in the sun, in the shade and indoors, over the course of a week. Please excuse the shiny cuticles. It's sunscreen that I didn't rub in well enough. I rubbed it off my nails but didn't see it in my cuticles until I downloaded the photos. Sometimes it's scarey how much you can see in a macro photo. Have you ever seen a more splendid red? 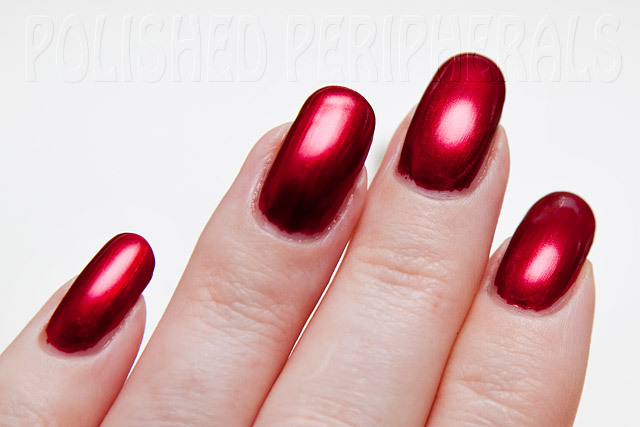 Perceval is a rich shimmery red with a beautiful glowing 'lit from within' look. Wonderfully pigmented and easily opaque in one coat but I did two thin coats. 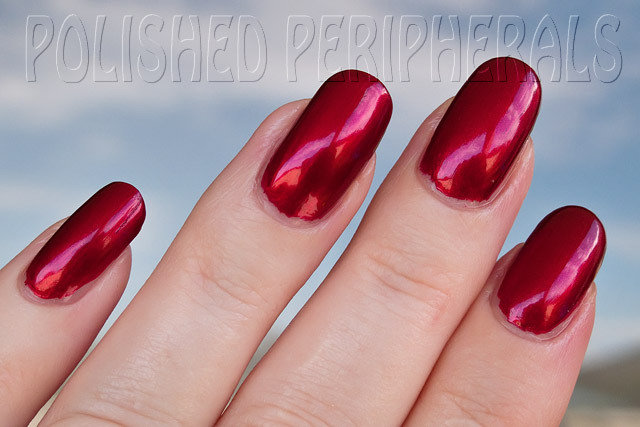 I like pretty much all polish colours and love glitters, duochromes and holos, but my first love will always be a good clean red, the shinier the better, especially when my nails are long. There's something about a smooth, flawless red that's classic, a little bit naughty and totally grown up. I have finally found my perfect red. Until now I had a few contenders but Perceval tops them all. In the lowest of light my darling Sir Perceval still has that spark within and in sunlight he outshines them all. I must admit part of the attraction of the a-england polishes is the names and the stories behind them. I've read many different versions of the King Arthur and the knights of the round table stories and Perceval, the red knight, was always a favourite of mine. 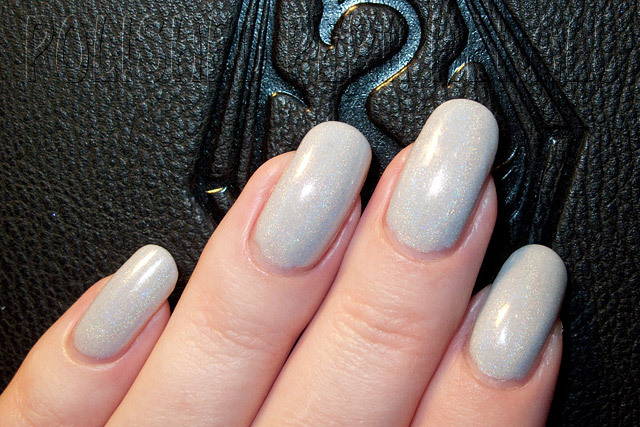 I wore Perceval for 7 days with Essie Good to Go as my top coat (I don't have a-england The Shield top coat) and there was no chipping, peeling or cracking and my nails were shiny and glowing till the end. The only reason I removed Perceval is my nails grew too much. Removal was easy with no staining at all. I really enjoyed seeing my flashing red nails every time I looked down this week. Typing, making coffee, even changing nappies. Perceval was my bright spark in every day. We started the week with with lots of sun and ended the week with 3 days of rain but I still had my Sir Perceval to make me smile. I thought it was cool the way my nails matched this custom coke can my husband got me. 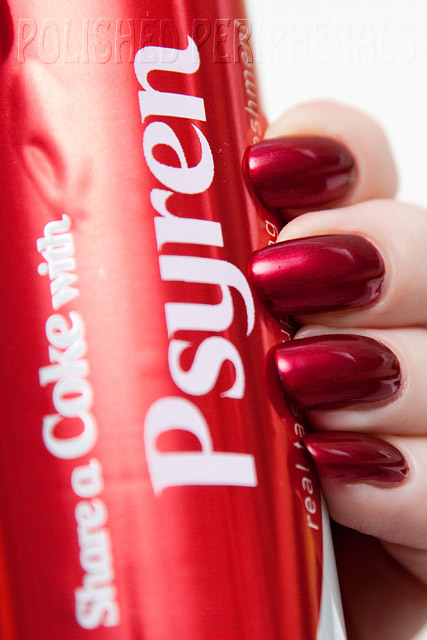 I don't drink coke but the current coke cans have peoples names on them and pSyren was my original IRC name when we met. Fortunately though, just like Doctor Who, Perceval will regenerate and return to my side (thanks to a replacement from Adina). I've said it before but it's worth saying again, the customer service rocks! Adina is a sweetheart and an inspiration. She has the most handsome cat called Tristam and I love her 'united world' policy of free international shipping.